Kedaar completed 7 months last friday.We went to a birthday party in the evening and went to temple from there. Last week has been pretty hectic for us as Kedaar's day care lady took vacation. So I and Chandra worked in shifts (morning 6 AM - 12.30 PM and 1 PM-8 PM). We also got the playzone last week. It is very spacious,colorful and is helping Kedaar to be safe in one place. However the problem is that he does not want to play there alone and we have to accompany him most of the times. Otherwise he stands by holding onto it and keeps waiting for us to pick him up. He is also trying to walk little bit by using it as support. Slideshow of Kedaar's recent photos. 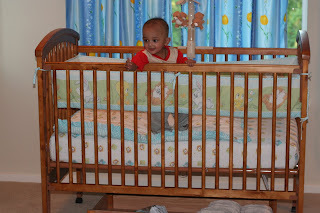 Over the long weekend, we bought a wood crib and mattress for Kedaar from target. He has been sleeping in that during night for 2,3 days now. As Kedaar is able to stand now, he hits himself to the wood railings and tries to jump if we keep him in the crib when he is awake and active. 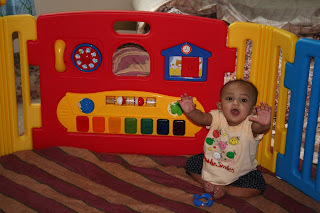 He is able to reach the mobile toy also with his hands. So we just put him in crib after he comepletely falls asleep and also removed the mobile toy.